In our second article, we take a look at your options for making international payments by cash, travellers’ cheques, bank cards or cheques. You may have wondered if the simplest option is to just take out cash in the UK and carry it with you. However, while it’s good to carry some cash with you when you’re travelling, this is a much less secure option for larger amounts. You may need to declare the cash at customs and your travel insurance may limit how much is covered if anything were to happen to the money. If you are looking to purchase some foreign currency, it can be helpful to plan the purchase in advance. This way, you can keep an eye on the currency markets and you have the opportunity to shop around to find the best deal. If you leave it to the last minute and buy your travel money at the airport or on a ferry, you could find the exchange rates on offer are considerably worse than you might be offered elsewhere. Travellers’ cheques, or more recently prepaid currency cards, are a more secure option than cash, as they offer some protection if they are lost or stolen. Travellers’ cheques require a counter signature to be valid, and you can report them as lost or stolen if you have a record of the serial numbers. Card providers may be able to block prepaid currency if they are reported as lost or stolen, and some cards also require a PIN for additional security. However, these methods can be less cost effective than purchasing foreign currency. You may be charged commission when purchasing or cashing in travellers’ cheques. A range of additional fees may also be applied to prepaid currency cards, such as card application fees, renewal or replacement fees, withdrawal fees, top up charges and fees for inactivity. Using your UK debit or credit card to make payments or withdraw cash might seem like a simple and secure way to access your UK bank account while in France. But you may find that your card provider charges a hidden fee for withdrawing cash or making payments. You might also receive a poorer than usual exchange rate. When making payments with a UK card, some retailers might offer you the option of paying in Pounds, not Euros. Again, this may not use the most favourable exchange rate so you may wish to avoid using this option. The use of cheques is widespread in France, and it is only in recent years that card transactions have overtaken payment by cheque. Everyone from hairdressers to electricians to schools and clubs may request payment by cheque. However, they may not be able to accept UK cheques as payment, because these can be slow to clear and incur additional charges. Opening a bank account in France will give you a wider range of options for managing your money. It will give you access to a French bank card. A card fee , paid annually or monthly, usually applies. 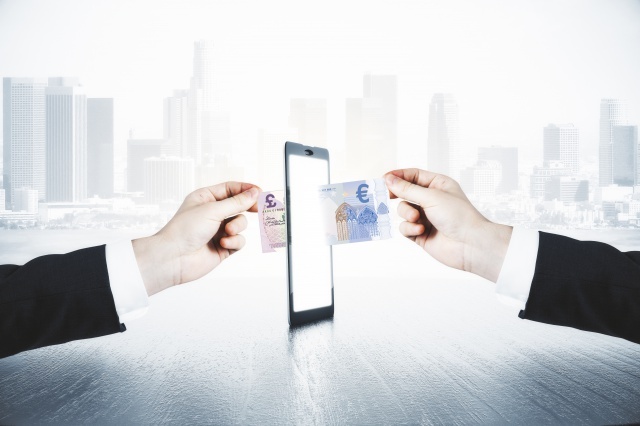 Transactions are generally free of charge for Euro payments and many banks will offer free withdrawals in France as long as it is from one of the bank’s network of ATMs (charges can apply when using other banks’ ATMs). A French bank account will also enable you to make and receive payment by cheque. There is no fee for making payment by cheque or crediting a cheque into your account. Just remember that it is illegal in France to write a cheque for an amount exceeding the balance of your account, and cheques remain valid for 12 months and 8 days. Having a bank account in France gives you greater flexibility to decide how to manage your money. You can transfer your money from your bank account in the UK, and then you can use ATMs, write cheques or make card payments without incurring international charges. If you choose to open a bank account in France, the Britline International Payments Service can help you to transfer money quickly, easily and securely between the UK and France. For further information on the Britline International Payment Service, click here. * Britline International Payments Service is powered by HiFX. HiFX Europe Limited is authorised by the Financial Conduct Authority under the Payment Services Regulations 2009, registration 462444, for the provision of payment services. HiFX is also a registered MSB with HM Revenue & Customs. Registration number: 12131222. HiFX accepts no liability whatsoever for any loss or damages suffered through any act or omission taken as a result of reading or interpreting any of the above information. HiFX is a limited company registered in England and Wales. Registered number: 3517451. Registered office: Maxis 1, Western Road, Bracknell, Berkshire, RG12 1RT.